In one of the most surprising developments in the wine world since Ravenswood Winery infiltrated NASCAR, I recently found out that Maynard James Keenan of the hard alternative, industrial-tinged rock bands Tool and A Perfect Circle (and the new band, Puscifer) has started his own winery and vineyard [info courtesy of Rasputin Music’s Infamous, Incredible Newsletter]. The endeavor has actually been going on for 6 years, meaning that Keenan is already producing wine from his own vineyards in the Phoenix, AZ area. Keenan has named his winery Caduceus Cellars, after the ancient Greek symbol of commerce (and somewhat inaccurately for medicine in North America). His estate vineyards are named Merkin Vineyards (no comment on that name, look it up for yourselves!). He has given out a lot of information on their outstanding website, which is one of the most beautiful and one of the creepiest wine websites I’ve ever come across. Visiting the store, here and here, proves that he isn’t planning on messing around with this new artistic front…the flagship named Nagual del SENSEI, an interesting blend of Cab Sauv and Syrah, is priced in the $90’s. Nicely, they also require that you agree to delayed shipment during the hottest months of the year in Arizona, just to enter the wine store. While building up his vineyard sourcing contacts as well as his own fledgling estate vineyards, Keenan sourced fruit from Pope Valley in Napa Valley. I have an interesting story about some vampires that allegedly reside in that little valley that might fit quite nicely here, but I’ll resist for now. Speaking of mythic beasts, the names that Keenan has chosen for his wines are just plain fantastic. The Nagual, mentioned earlier, refers to a Mesoamerican shapeshifter or a person that can transform into a particular animal. Continuing that trend is the Merkin Vineyards Cabernet Sauvignon, entitled Chupacabra. Anyone who names their wine after a Mexican mythical beast who tends to attack and feast on goats is pretty cool in my book. 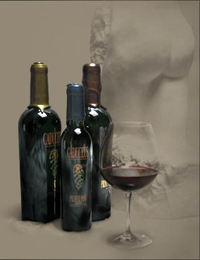 Check out the website for his on-going journal about growing and making these interesting wines! AWESOME. I’m fan of Tool’s and APC’s music and really looking forward to (or at least trying to figure out how to) drink this wine. The website is awesome too… a very creepy Myst-like (remember those computer games?) Flash page. Well done. I think these guys are doing a good job with the marketing. They are taking themselves serious without going too far. And they seem to be taking the wine itself seriously as well. I’d even say that the stories/themes behind the wines have more clout than even the “Castle of Dracula Wine” that is produced out of Europe by “the last remaining descendant of Vlad the Impaler”. Great post. I’m caught up in the website as we speak. Hey there, Jason. I was totally into the website, too (and I *love* the Myst series, ever try any of the many new adventure games out there? )…I hope that you had the volume up on your computers, it even has great background ambiance! I totally agree, he’s doing this in a totally unique way for wine, yet it is a very balanced approach. I’ve heard of that Dracula wines, but never actually seen them. Now I see why, due the the US distribution challenges. I also agree that the stories and themes are much more complex and structured (like their wines, hopefully, I really want to try them, too!) than Castle of Dracula, or the absurdly marketed Vampire Wines in Paso Robles (http://www.vampire.com/). I’m too scared to go to their website after what you two have said! Heh, it’s not *that* bad! 😉 Then again…it would have been great to have discovered this info and posted it around Halloween!